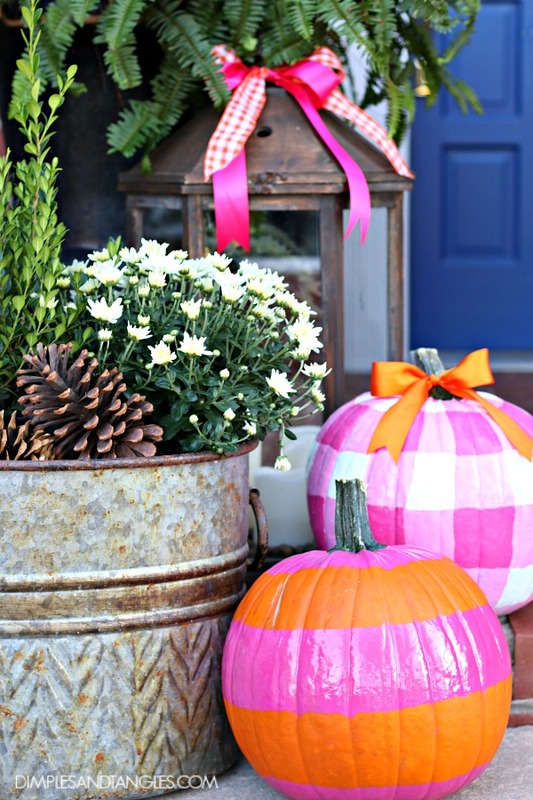 Thanks for all of the love on my gingham pumpkin and painted pumpkins tutorial! Moving inside, the Entry got dressed for Fall. 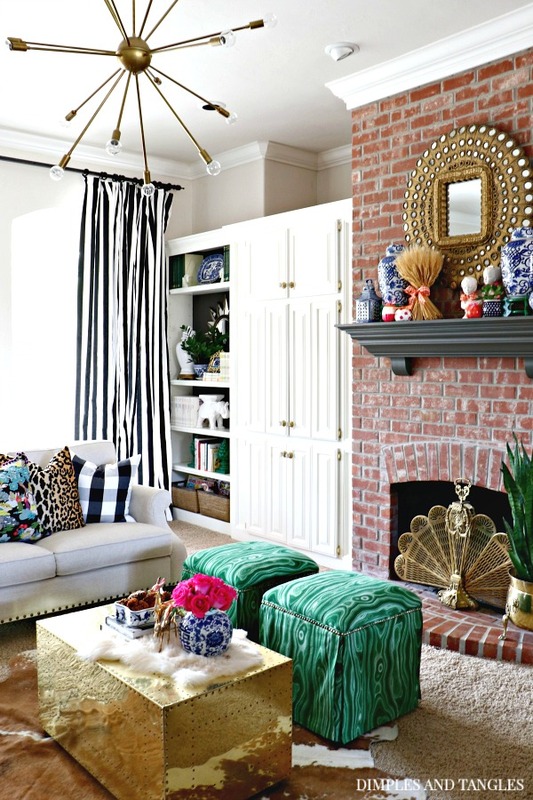 The hot pink and orange theme works perfectly with the rug, and I sprinkled in some blue and white with it too. 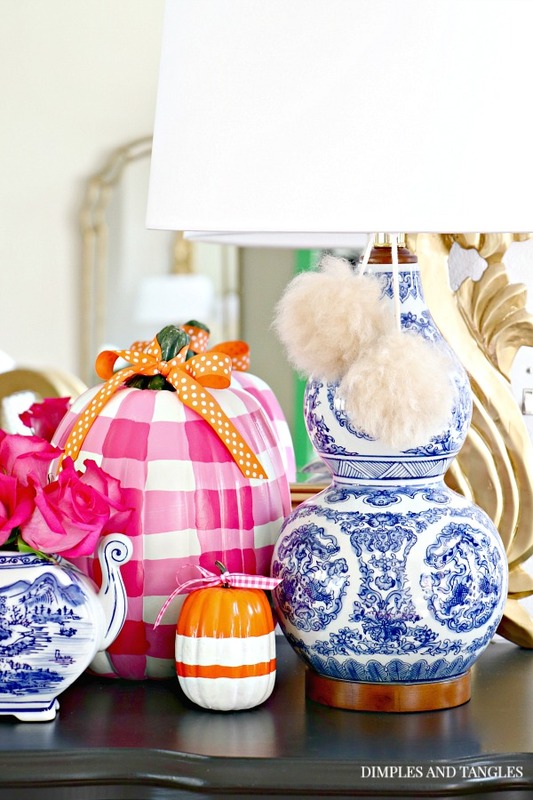 I wanted to share these new blue and white lamps with you. I came across a similar pair earlier this Summer, didn't buy them, then completely regretted it after a day or two. And of course, they were long gone by the time I came to my senses with no more to be found. 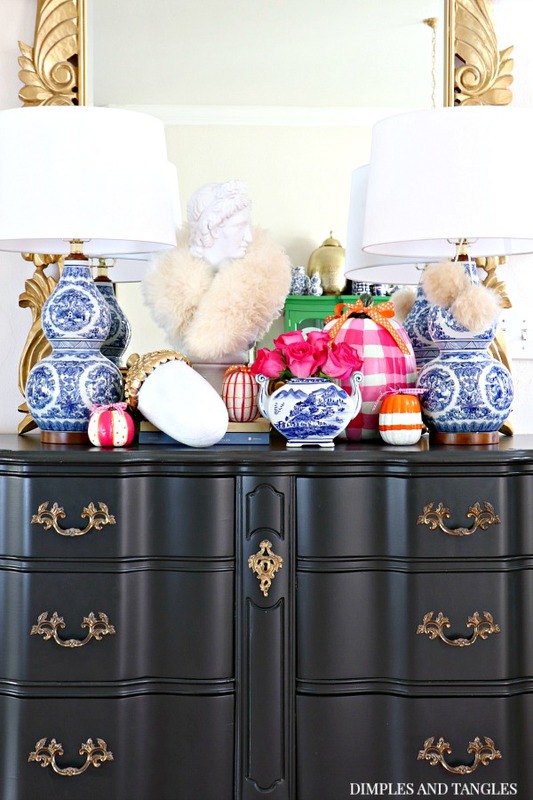 Imagine how thrilled I was when I came across the exact style from Lamps Plus! I didn't have to search around town for them anymore, they were available with a click of my mouse! :) Even better, if you love them as much as I do and act fast, they're on a terrific sale for just a few more days! One of the things I appreciate most about the lamps is that the shade is a true white, and it stays white when the lamps are turned on (it doesn't appear yellowish/tan like so many other light colored shades do). The wood base and finial are also nice touches. I added some fur pom poms that came off of the same thrifted coat that the collar on the bust is from too (I used the rest of the coat for this project). 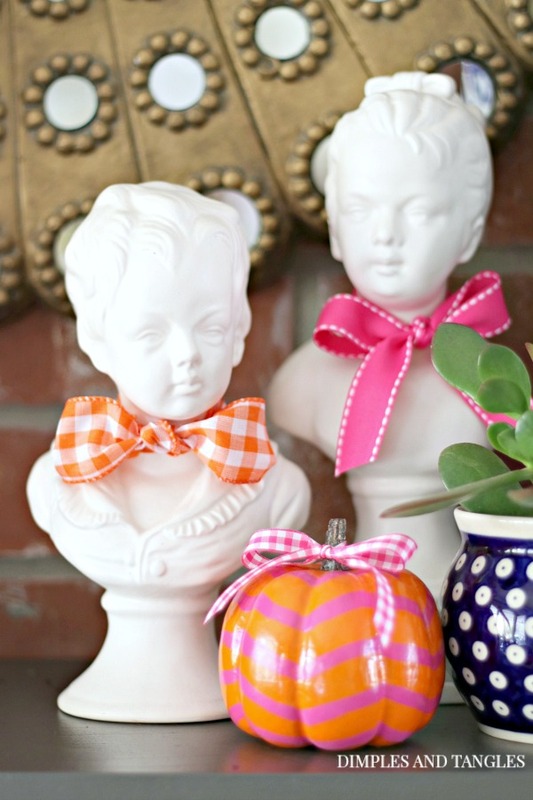 In the Living Room, I focused on just adding little touches of Fall, continuing with the hot pink and orange colors. 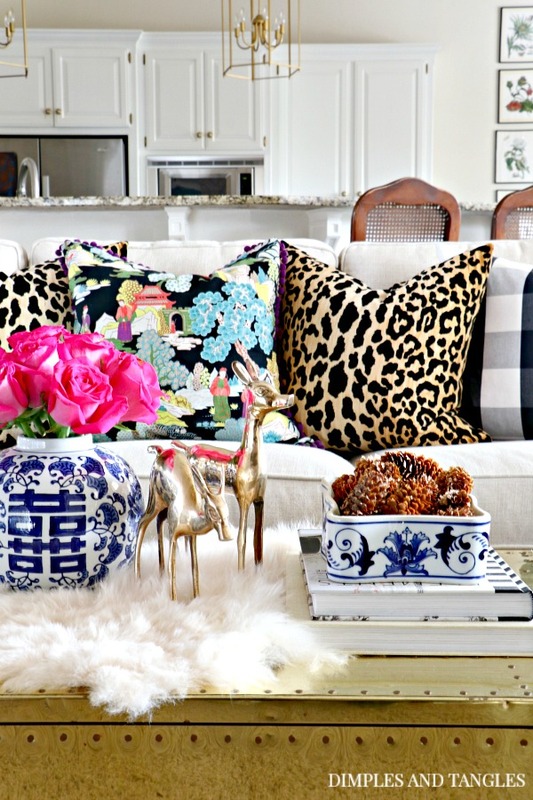 I pulled my buffalo check and leopard pillows out for the season, the multi-colored toile pillows were made from a drapery panel from the thrift store. 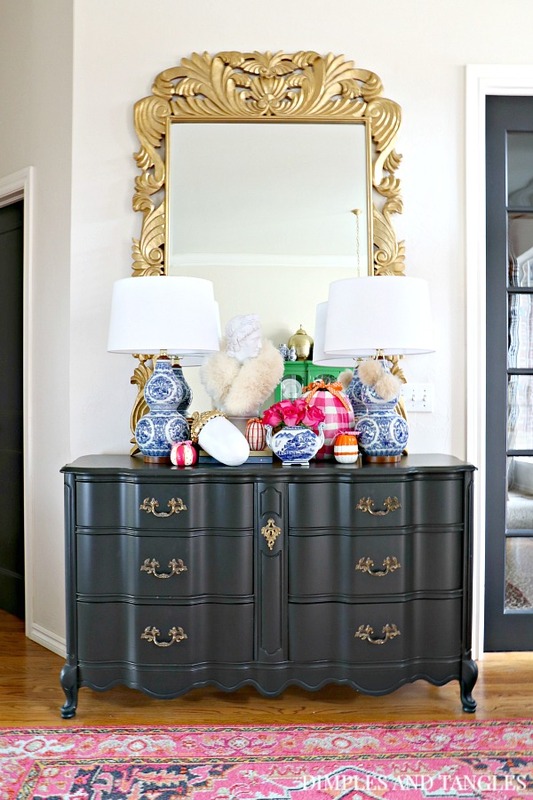 Turns out that fabric was vintage and high end, read more about it here and see some options to get a similar look. The small brass deer were an Estate Sale find, and I left the lid off of the blue and white box and filled it with small pinecones. And now that I think about it, the fur is a piece I had left over from the project I mentioned before. I didn't change the mantel much from how it's looked through the summer, I just added a few pumpkins and a bunch of standing wheat. 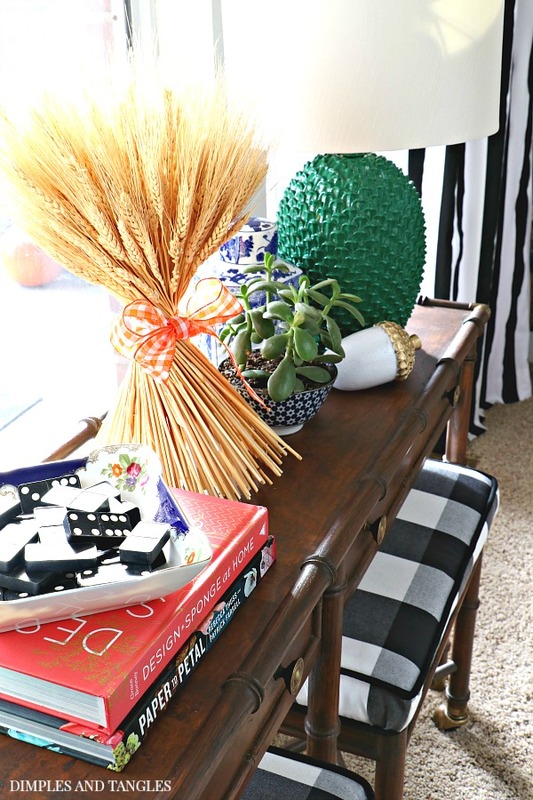 At the moment my bamboo console table is tucked against the windows so it's hard to photograph, but it got a few Fall accessories too. I brought the succulent bowls that usually line the patio mantel inside for the winter and scattered them around the house, they're a favorite little accessory that fit in anywhere! 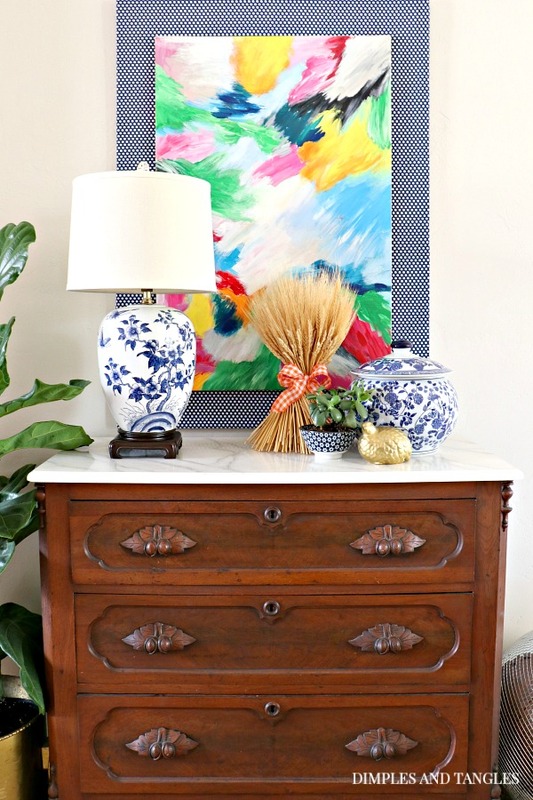 You saw a sneak peek of this little corner the other day when I shared my Wi-Fi Guest Password Sign. 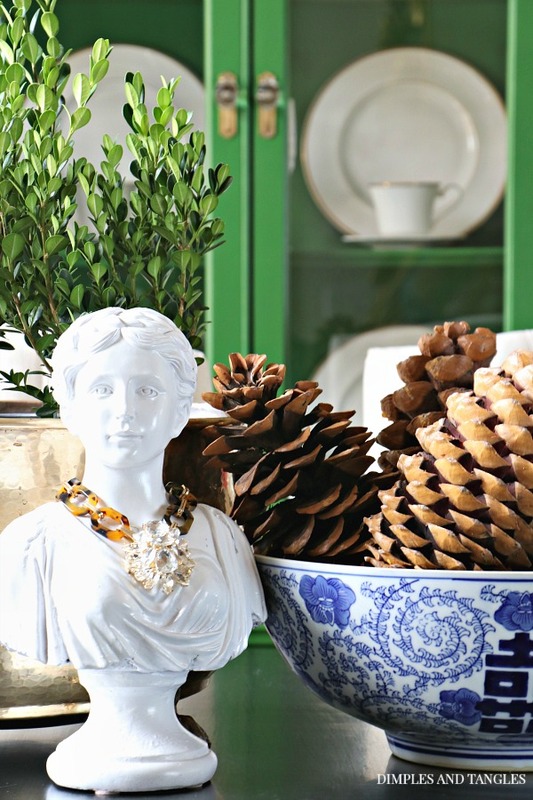 In the Dining Room I just did a simple centerpiece of boxwoods in a brass pot, giant pinecones, and a girl bust (wearing a tortoise necklace for Fall of course). I was editing late last night and just noticed something out of place in this photo... do you see it? Oops! 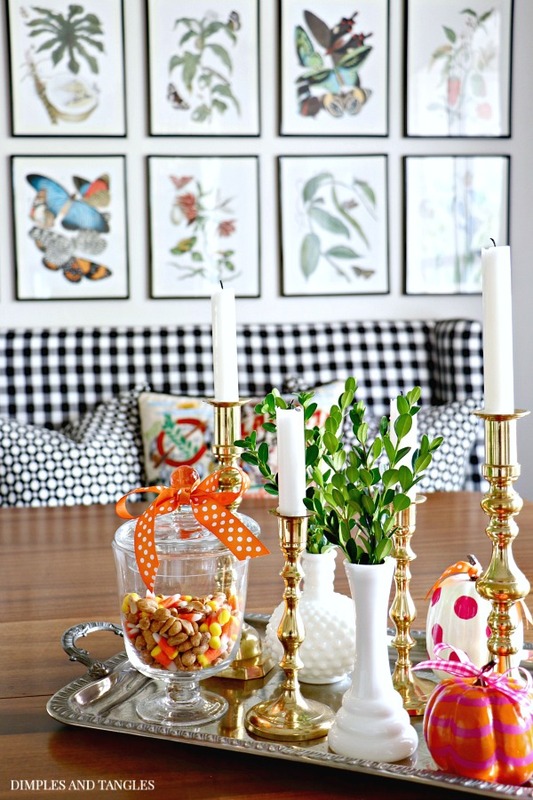 The table in the Breakfast Nook got a simple centerpiece as well- mixed metals, a bit of greenery, painted pumpkins, and the best Fall snack mix ever. ;) A personal friend that I follow on Instagram lives in the most wonderful home in NYC and has tapers on her table that I think she burns for most every meal. They always make her mealtimes look extra special and she's inspired me to burn tapers on the table more often for everyday, not just special occasions or holidays. I hope you enjoyed the Fall Home Tour today, I probably should have called it a "Vignette" tour! Can you get on board with untraditional colors for Fall, or are you a die hard red/brown/orange/yellow decorator? I used to be until this year! *This post is in partnership with Lamps Plus, all product opinions and reviews are mine. 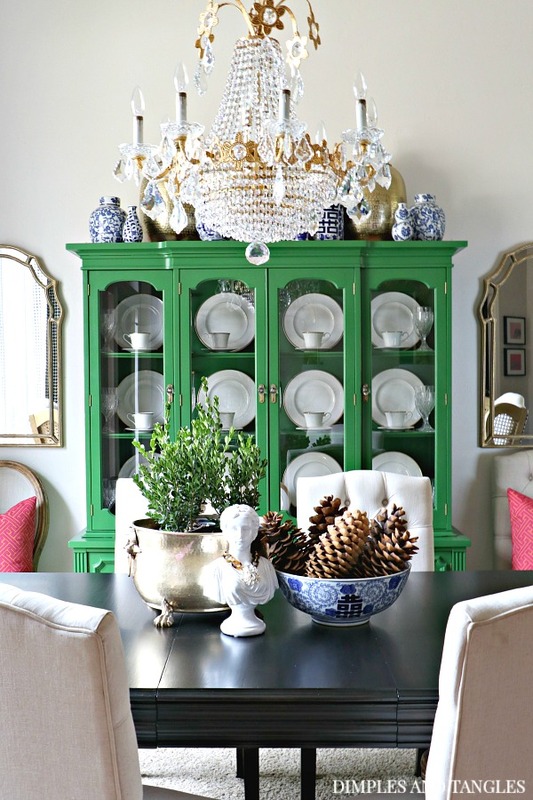 your home looks so festive and fun and i am so grateful it's not a christmas tour- too soon! 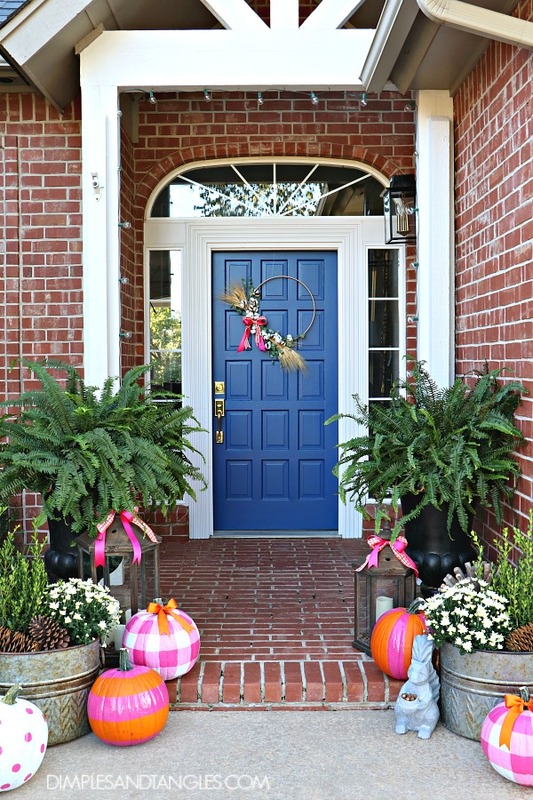 Love your large galvanized planters in your porch photo. Do you have a source for those? Thanks! Thank you! They are from At Home but I bought them last Fall, not sure if they still carry them or not. So pretty Jennifer. 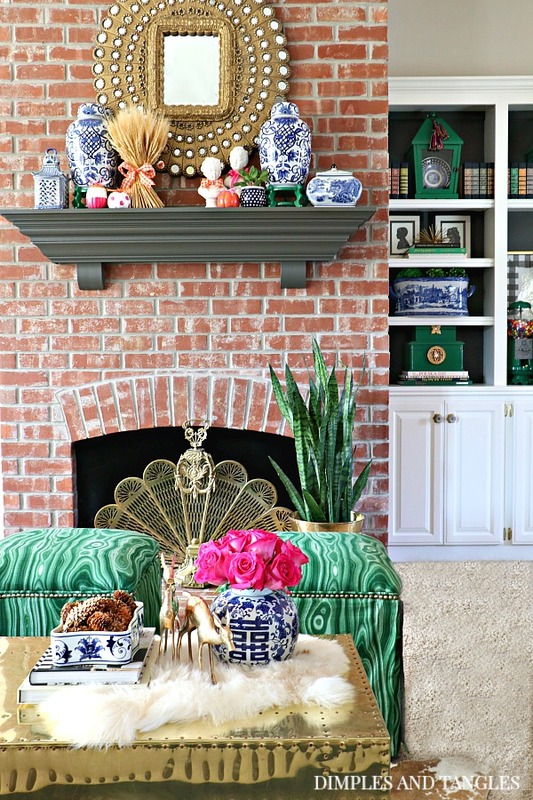 Love all the pops of vibrant color! Okay, I give....what's out of place in the dining room photo? As usual, everything looks perfect. You make my day when I get to read one of your posts. Well good, I'm glad it doesn't stick out as much as I thought! I moved some chairs around but ended up with two different ones on each side of the hutch. ;) Thank you for your kind words, Jayne, that makes MY day! I didn't notice either and was hoping someone would point it out in the comments! Both are a nice neutral beige, so they are a close enough match in my book ;) Can't wait to see your Christmas home tour, I have used so many of your ideas, love your creativity!